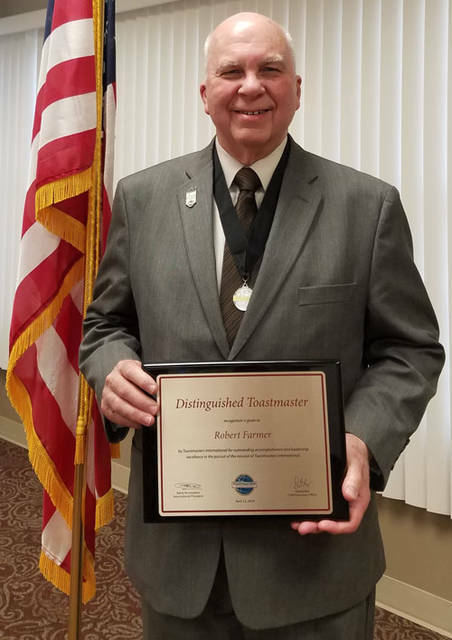 Robert Farmer is pictured with his Distinguished Toastmaster award. The recent Greenville Toastmasters meeting included members (l-r) Dave Huelskamp, Bev Delk, Jim Sink, Linda Farmer, Gary Venega Leah Lines, Tim Head, Diane Delaplane, Ross Gruber, John Gallagher, Teri Gallagher and Bob Farmer. 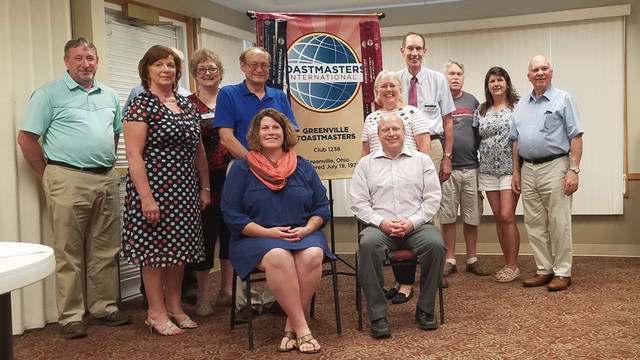 GREENVILLE – The Greenville Toastmasters No. 1238 “The Can Do Club” congratulated member Robert Farmer on his recent achievement of receiving his Distinguished Toastmaster award. The DTM award is given only to those who have demonstrated outstanding leadership and communication skills and also helping others in their self-development efforts. Farmer has assisted the local Greenville club, the district and community in various activities and leadership roles. The Greenville Toastmasters Club also received the Toastmasters Distinguished Club award for the 2017-18 program year. Greenville Toastmasters is part of the Toastmasters Division A Area with Tracy T. Baker, DTM as its director. Dave Huelskamp is the club’s Area 4 representative. Officers for the Greenville TM club 2018-19 year are President Bob Farmer, Vice President of Education Linda Farmer, Vice President Membership Leah Lines, Vice President Public Relations and Secretary Diane Delaplane, Treasurer Beverly Delk, Sergeant-At-Arms Jim Sink and John Gallagher. Visitors, guests and members are always welcome to attend and join in on the fun of listening to speeches and share in the friendships at any of the Toastmasters events. Upcoming meetings will be July 24, Aug. 14 and Aug. 28. Meetings are from 7 to 8:30 p.m. and located at the Brethren Home, Chestnut Village, 823 Chestnut Ave., Greenville. Upcoming special event will be the Toastmasters 2018 International Convention, Aug. 22-25 in Chicago. A Toastmasters meeting is a learn-by-doing workshop in which participants hone their speaking and leadership skills in a no-pressure atmosphere. There is no instructor in a Toastmasters meeting. Members evaluate one another’s presentations. This feedback process is a key part of the program’s success and personal development. During the meeting participants also give impromptu talks on assigned topics through manuals, conduct meetings and develop skills related to timekeeping, grammar and parliamentary procedure. The Greenville Toastmasters “The Can Do Club” was chartered on July 19, 1971, and has been active in the community through all these 47 years. To learn more about the Greenville TM Club, contact one of the officers or call Delaplane at 937-548-8799. Community members also may check the group’s website, https://greenvilletoastmasters.toastmastersclubs.org and https://www.Toastmasters.org.